I was watching Gold Diggers of ’49 the other day with my daughter as we made our way through old cartoon shorts. That’s how I grew up – on Bugs Bunny, Daffy Duck, and the other WB shorts along with the Disney shorts. Sometimes, late at night, they’d show the black and white cartoons like this one, but I mostly found the black and white cartoons boring. They came from a time when animation was very experimental and new so people were impressed that these drawings could move around. There often isn’t much in the way of plot and the jokes are usually broad gags carried over from vaudeville. 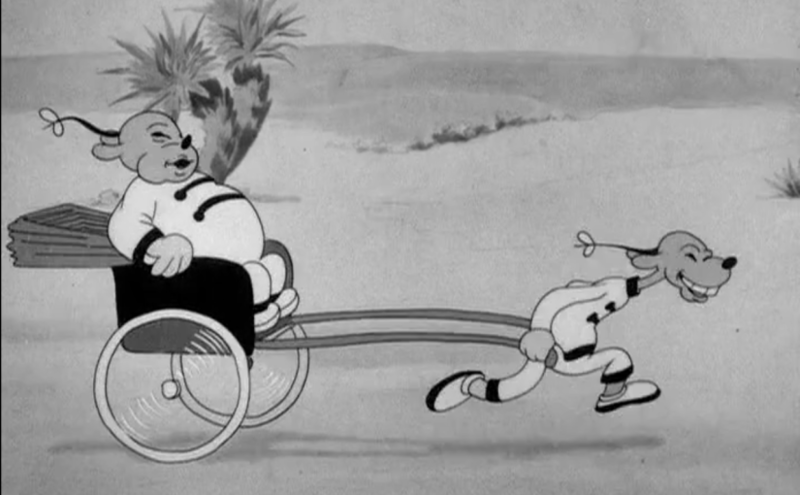 Of course, something that carried over into the color cartoons way long than it should have was racist humor. The crazy thing is that I remember seeing blackface gags when I was a kid in the 80s. So it took a LONG time for people to realize it was not exactly a great thing. There’s also a crazy amount of asian racism in cartoons. The asian version of the blackface gag (you get sprayed with ink or something and now you’re black) is usually the cymbal gag – a cymbal falls on your head and now you have asian eyes and maybe even more stereotypes. But it’s so rare to see a two-for-one racist joke like I saw in Gold Diggers of ’49. What’s so weird is that our ancestors (culturally if your ancestors didn’t grow up here) actually found this amusing. My wife asked why the blackface gag is even funny and I couldn’t articulate a reason because it’s not. It’s just weird, even if you’re not considering the racist aspect of it. When I was a kid, I never understood. I just thought it was a thing – Wiley Coyote can walk off a cliff without consequences as long as he doesn’t look at the ground and any character that is hit with ink says “Mammy”. It was bizarre to me and, even as an adult that understands the history of blackface, it’s no less bizarre.